It was difficult to pick my 11 favorite posts of 2011 considering I wrote 108 posts this year, not counting this post! 2011 was a pretty great year. I had the opportunity to present at the ASCA conference in Seattle, WA, started School Counselor Tweet Chats, hosted lots of giveaways, made video posts, and much more! 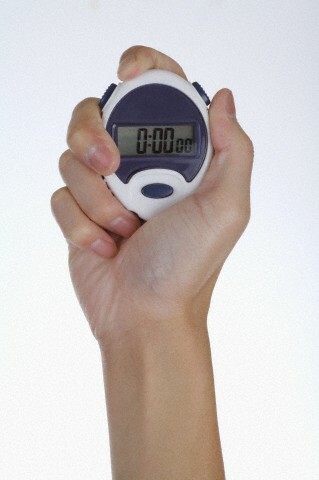 I have enjoyed connecting with you in 2011 and can't wait to see what is in store for 2012! Below I outlined 11 of my favorite posts and why they made the list. One of my biggest accomplishments of the 2010-2011 school year was starting Career Cafe at my school. It has been an amazing ride since implementing it. Students are so excited to learn about careers first-hand from people in their community. I am learning so much from the speakers too! 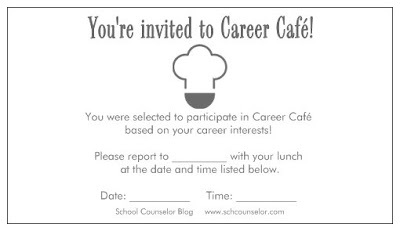 Career Cafe is one of my favorite programs I implement as a school counselor. 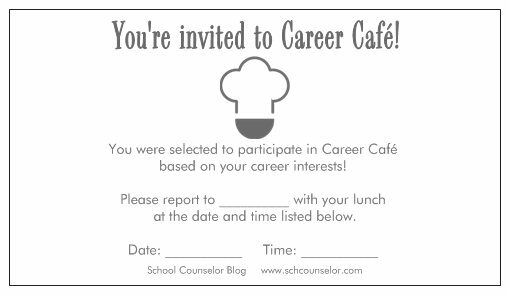 Many School Counselor Blog readers have emailed me or tweeted that they are now implementing Career Cafe which is AWESOME! This post includes LOTS of information and forms so be sure to check it out! On a whim I started School Counselor Tweet Chats! I had been following other twitter chats and thought, "how cool would it be to have a School Counselor Tweet Chat?" I set a time and date and that is how the First Ever School Counselor Tweet Chat was born! School Counselor Blog is partnering with SCOPE to have a School Counselor Tweet Chat every month! I co-authored the "Expanding Your Professional Learning Network with Twitter Chats" post with Dr. Erin Mason from SCOPE. School Counselor Tweet Chats take place the first Tuesday of the month at 8pm EST. #scchat is the new hash tag you can follow to participate in future School Counselor Tweet Chats! Keep checking School Counselor Blog and SCOPE for updates on what the future chat topics will be about! 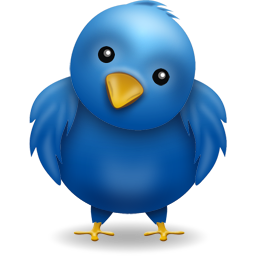 You can learn how to participate in School Counselor Tweet Chats and view past tweet chat transcripts. In the spring I ran a self-esteem group for 5th grade girls. I had an idea to have the girls give each other compliments and fill each other's buckets! This session became a bucket-filling extravaganza! The girls loved it and even wanted to fill a bucket for the group! Compliments, Self-Esteem, and Bucket-Filling was a lot of fun! I highly recommend trying bucket filling in one of your groups! I am planning on doing this activity as a closing session for two different groups I am currently running. One is a boy group and one is a girl group! Side note: If you act fast you can get buckets for 30 cents right now at Target in the dollar spot! All of the yellow dot items are on clearance for 70% off regular price! I just bought 20 buckets today for $6.00. The School Counselor Survival Kit is comprised of items I consider to be essentials for a new school counselor or school counselor intern. 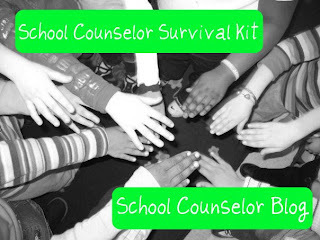 In this post I share items in the School Counselor Survival Kit how you can use them. As a new school counselor or intern it is hard to figure out what you need or where to get started. Hopefully this kit will will inspire new school counselors and school counselor interns and help them on their journey! Over the summer I wrote a post about 3 Ways to Have a Ball with a Beach Ball All Year Round. After writing the post I decided to make a how to video about How to Create a Question Ball with a Beach Ball. 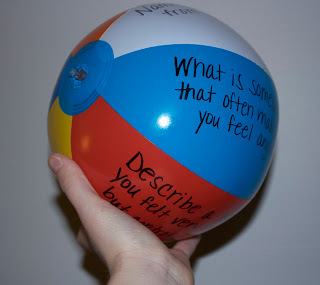 Using a beach ball is a simple, cheap and affordable way to make a question ball instead of paying upwards of $15 for a "therapy ball." Writing about my 2010-2011 School Counseling office is bittersweet. I love this post because of how I was able to use Prezi to give a tour of my school counseling office and share pictures with you all! I was definitely lucky to have such a large space as an office! I was disappointed to report that I had to move to a new office for the 2011-2012 school year. I shared some pictures, but it has changed a lot since that post. I will be sharing more in the New Year so you can see what it looks like now. It will never be the same as my old space though! It was pretty special and I miss it a lot! Words cannot describe how excited I was when I found a black hat in the dollar section of Target!!! (Have I mentioned lately how much I LOVE the Target $1 Spot!) I rushed home and immediately constructed a Bully Hat inspired by one of my FAVORITE books Confessions of a Former Bully by Trudy Ludwig. In my "I Made a Bully Hat!" post I explain the bully hat and how to make one! I love using a career theme for Red Ribbon week! My favorite day of my theme week is Career Dress Up Day! This year I found inspiration for my Career Dress Up Day while at Ikea! I decided to go as a vet after finding an adorable stuffed dog and a vet kit. I bought a lab coat and borrowed a stethoscope from my brother to complete the look. I had a blast caring around my stuffed Ikea dog and vet kit. The kids loved it! I got the idea to give Hershey's Hugs to the staff at school after participating in one of the School Counselor Tweet Chats. I printed out messages on card stock that said "Thought you could use a HUG or two!" I gave them out anonymously to the staff at my school by sneaking into the mail room early in the morning and placing two hugs and a message in each mailbox. 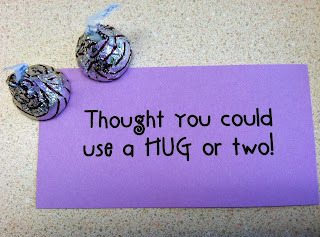 Giving out hugs was a simple, low cost way to give the staff at my school a little morale boost! Self-pillows are a great activity for groups on the topic of grief/loss, self-esteem, and incarceration, and many more! I made 9 Patch Self-Pillows with my group for students experiencing the incarceration of a loved one. The students LOVED the idea of having their very own personalized pillow. I still have students from the group tell me about their pillows. They see the pillows as a source of comfort and an expression of themselves. I am thinking of a way to make this a no-sew activity so that students can do this at school. I think it would be even more meaningful if they put it together themselves through sewing or another method. Last but not least, I wrote about "Minute Meetings" in a recent post and have gotten lots of positive comments and feedback! "Minute Meetings" are a method of meeting with ALL students on your caseload. In this post I provide a link to the template I used and the questions I asked! If it seems unbearable to meet with ALL students try breaking it down into weeks or grade levels. Just think... even if you had 600 students on your caseload you could take 1 hour out of your week and meet with 30 students a week. In 20 weeks you would have met with all 600 students! 7. I Made a Bully Hat! I hope you enjoyed my 11 favorite posts of 2011! 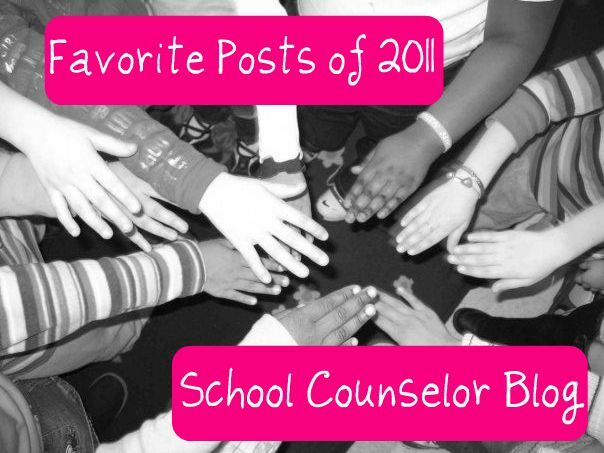 Please share your favorite School Counselor Blog posts below! I would love to hear from you! Looking for a quick and easy way to meet with EVERY student on your caseload? Keep reading to find out how you can start off the New Year by getting to know ALL of your students. I have been trying to figure out a way to meet with all students I serve. The school counselor I share a building with, Natasha, suggested we conduct mini meetings with students and call them "Minute Meetings!" I immediately LOVED this idea and could not wait to get started. We decided to ask students four questions during the Minute Meetings: "How are you doing/feeling?" (personal/social), "How is school and grades?" (academic), "What do you want to be when you grow up? "(career), and "What questions/concerns do you have?" to address any other needs they may have. I made a "Minute Meeting Form"Google Document of the sheet we used to take with us to the classroom. I printed the sheet out on card stock and clipped it to a clipboard. The "Minute Meetings" are meant to be brief in order to reach every student, so we did not ask too many questions. To set up the meetings we sent an email out to all of the teachers explaining what "Minute Meetings" are and asking them to reserve an hour time slot with their class. My plan is to pull a chair into the hallway and meet with students using your class list. I will pull students one-by-one. I will have each student send the next person out when their check-in is over. I would like to keep these to a minute, but I imagine that will be quite difficult. In order to have enough time with each student I would like to schedule an hour block with each class. Please sign up in the time slots provided below and please REPLY ALL so that everyone knows what time slots are taken. Thanks! *** I did not include 8th grade in this email because I scheduled their classes during a different week. I included a 9th grade planning aspect to their meetings so they took a little longer. I plan to write a post to explain more about this process for 8th grade. Our classes are rather large with some classes having 30 students in a class. We wanted to make sure we had enough time to get through each class in case some students talked a little longer than others. Once teachers signed up for a time slot with me I sent them an invitation through Outlook, the email system we use at school. This worked very well because teachers had a reminder that I would be coming to conduct the meetings. The meetings went very well. It was great to meet with students I had never really talked with before. Having the "Minute Meetings" is helping me learn the names of all my students and has made me realize how many names of students I already know from being at my school for going on 3 years. My 8th graders whom I have known since 6th grade were impressed that I even knew the spelling of their names without looking at the class list. Students were excited that they got their own "Minute Meeting" with me! It was funny because after I had conducted the meetings with a few classes word got around that I would be doing it with all classes. Students would stop me in the hall and ask "When is my Minute Meeting?" It made me even more excited to conduct the meetings when I knew students were looking forward to it. "Minute Meetings" have been great for helping me identify some students who may be in need of individual or group counseling that I was not aware. At this point I have four more classrooms to meet with in order to finish up my "Minute Meetings." I have met with over 270 of my 360+ students on my caseload. I also have to go back and meet with the students who were absent on the days I conducted the "Minute Meetings." I think the next time I facilitate "Minute Meetings" I would use scaling questions. Many students answered good or great and it would be beneficial to be able to gauge what "good" means to students. I think it would lead to a more purposeful questions/answers and identify more student needs. I would love to hear your feedback about "Minute Meetings!" What do you think of the "Minute Meeting"idea? How would you conducted "Minute Meetings" with your students? What questions would you ask? How would you modify the "Minute Meetings?" It has been challenging this year to get all of my holiday preparations done! Thankfully Shutterfly makes it super easy to make adorable cards! I just made this card today on Shutterfly to send out as my holiday card this year. 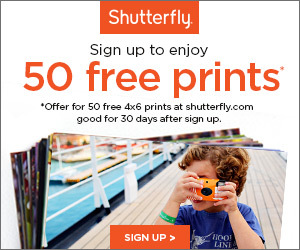 Visit Shutterfly.com for classic photo Christmas cards. Do you send holiday cards? Where do you purchase them? Do you include your pets on your holiday cards? Comment below, tweet, contact Danielle, or share on the School Counselor Blog Facebook Page! School has been rough this year. School has been VERY rough this year. I usually try to keep my blog positive, however I do not want to give the impression that I never have a bad day and that I never get stressed out. I get stressed out A LOT! I also have my fair share of bad days! I am fortunate that I have an amazing school counselor with whom I share a building. We support each other on days that are horrible, wonderful, and everything in between. I am also fortunate to have a supportive family and husband who will listen to me vent. To get myself out of a negative funk, I try to focus on things that make me feel positive and productive. Filling my day with student meetings, groups, and lessons leaves less time for "other duties as assigned." The other day I was so frustrated with things that were beyond my control. I was having a difficult time being positive. I decided that I was going to buy pipe cleaners. I wanted to facilitate my Rudolph the Red-Nosed Reindeer lesson with 5th grade this year, but I wanted the students to have some kind of a visual take-away or craft as a reminder for the lesson this year. I found this adorable Rudolph craft from Family Fun Magazine on Pinterest. I had idea of how I could modify it into a craft to use in a Rudolph lesson about bullying, diversity, and being yourself. I will have students create their own unique reindeer using brightly colored pipe cleaners for antlers and glitter pom poms for noses. I ordered all of the supplies I would need using my school budget on eSchool mall through Staples. My favorite part about the items you use for this craft is that all of the items are things I will use over and over again in crafts with kids. After ordering the supplies, I became excited and re-energized thinking of the lesson I would facilitate with students. I knew that if I ordered all the materials and planned for the lesson I would be able to make it happen. I am so excited that I will be doing this lesson in 5th grade this week. Hopefully, I will get some time this weekend to make a prototype to share with you! I wanted to get this out now in case anyone wanted to do this craft with students this coming week. For full instructions on how to do the Rudolph craft pictured in this post, visit Family Fun Magazine - Rudolph the Red-Nosed Hand Print. Even if I am having a horrible day, changing my focus to something like a fun project or my work with students helps me become positive again. It also helps me remember why I love my work as a school counselor! What do you do to help you become positive when you are feeling negative? Do you have any fun projects planned before winter break? Comment below, tweet, contact Danielle, or share on the School Counselor Blog Facebook Page! I am in a giving mood today and I wanted to show some love to my School Counselor Blog Facebook fans! 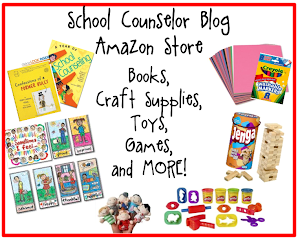 I need your help in determining my next giveaway on School Counselor Blog! If you let me know what you would like to win from School Counselor Blog you will be entered for a chance to win the item and it could be the next giveaway! Read the instructions below to enter! One lucky winner (U.S. only) will be chosen at random to win an item* that they comment about on the School Counselor Blog Facebook page. The contest for this giveaway will be closed at midnight and a winner will be announced on this item's contest page on Sunday, December 11th. 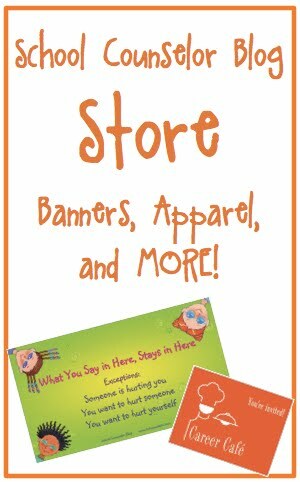 The item that the winner comments about will also be the next item for a giveaway on School Counselor Blog! Find a resource (book, product, toy, etc.) I used or mentioned in a previous post on School Counselor Blog that you would like to win. *The must be available for purchase in the School Counselor Blog Amazon Store. Visit the School Counselor Blog Facebook page and leave a comment under the contest description stating the item that you would like to win, how you will use the item, and provide a link to the post where the item was mentioned. Join School Counselor Blog and SCOPE for the next #sctweetchat on Tuesday, December 6th @ 8pmEST! We will be chatting about School Counselors role in promoting and supporting college and career readiness! Kelly Johnson (@Kjohnson222) will be the #sctweetchat moderator. In preparation for the #sctweetchat on December 6th, check out this newly released document by the National Organization for School Counselor Advocacy: Counseling at a Crossroads. For information on how to participate in a School Counselor Tweet Chat, click here! Check out transcripts from previous School Counselor Tweet Chats or access all of the tweets with the hashtag #sctweetchat. 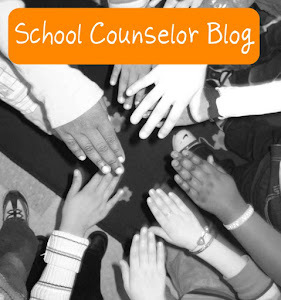 Visit School Counselor Blog and SCOPE after the #sctweetchat tweet chat for a full chat transcript. Looking for a fun and engaging way to introduce students to careers? 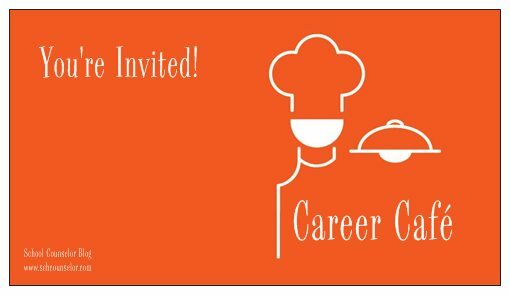 Starting a Career Cafe will help you build excitement about careers through community members sharing their career journeys! I wrote a previous post about starting and facilitating a Career Cafe. I recently presented at the Integrated Learning Conference and the Pennsylvania School Counselors Association Conference about Career Café with the school counselor I work with and the school counselor from whom we initially got the idea to start Career Café. Both presentations went very well! I wanted to give you an update about Career Café and provide you with additional information you can use to start your own! Last year we facilitated eight Career Cafés for 5th through 8th grade. Our speakers included an art teacher, bank branch manager, lawyer, chef, cosmetologist, news reporter, humaine society worker, and college basketball players. The response to Career Café was great! Students loved it and we loved facilitating it. Some of our speakers wanted to go above and beyond after working with our students. The lawyer who spoke at Career Café invited eight students to visit to Penn State Dickenson School of Law! Students were able to participate in a mock class, see the court room where students hold trails, eat in the dining area, and tour the campus. They had a blast! 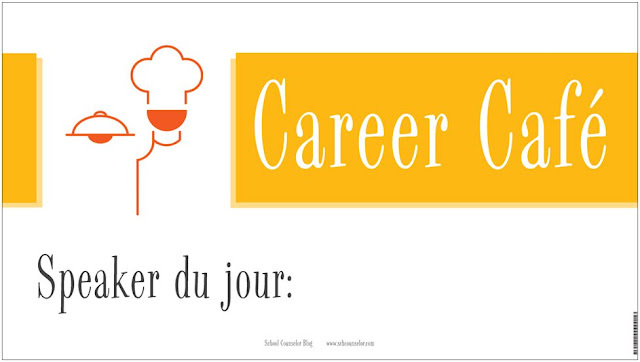 This year we are hosting ourCareer Café in our school library. 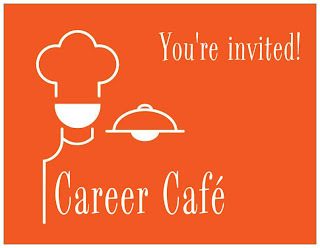 We are planning to facilitate Career Cafe for third through eighth grade this year. To make our Career Cafe look even more like a Cafe, we purchased polka dot table clothes over the summer. I also just made flower pens to put in vases on the tables. Here's a picture of what they look like with the table clothes! The flower pens add such a fun pop of color and students can use them for their surveys! It is a win-win! We have hosted two Career Cafés so far, a detective from our city police and a marketing specialist from a grief and loss counseling center. This year I made business card sized passes for Career Cafe using VistaPrint. I also made a banner on VistaPrint to announce our "Speaker du jour!" I used clear plastic page protectors and tape to affix the speaker of the day. Below are pictures of the banner in use this year. I hang the banner outside of the door of the library, which is our Career Café location this year. If you want to order pre-made Career Café items like the banner or business card passes pictured above visit the School Counselor Blog Store! Have you started a Career Café of your own? Do you have ideas of how you could start a Career Café at your school?